Reverend Teri is our priest at All Saints’, Russellville. She has been a priest for the past nine years, serving St. Peter’s in Conway, Arkansas, before coming to All Saints’ on October 1, 2017. 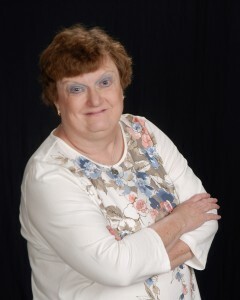 She enjoys preaching, teaching, writing, traveling, and spending time in the Ozarks. Teri is involved in the Greater Arkansas Interfaith Network, as well as with The Wisdom House Project (which supports a school for orphans in war-torn Syria). In addition, she is a consultant for the Hendrix Institute for Clergy and Civic Engagement. Teri is married to David Daily, a professor of religion at the University of the Ozarks in Clarksville, Arkansas. They have two children — Emma (24 years old) and Wilson (21 years old). Prior to entering full-time ministry, she was a practicing pediatrician. Kaye Staggs has been a member since 1983. She is a graduate of the IONA seminary for locally-trained priests and deacons. Before her ordination, she taught yoga and tai chi; she also coordinated altar ministries for the church. As a deacon, her ministry is to serve the community through the church. She is involved in many outreach programs: The VA-Clergy Partnership, River Valley Food for Kids, and River Valley Cherokee Church Outreach. She has also served on the board of several community programs. Kaye has volunteered for hospice care for seven years and worked with the diocese on human trafficking. She assists the priest with services and liturgical duties, and she is the mentor to our Karen members who have joined us from Thailand and Burma. 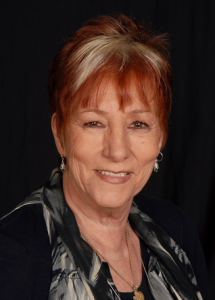 Kaye is married to Roy Joe Staggs, she is a mother, grandmother and great-grandmother to an extended family that brings much love and joy to her heart and life. The Rev. 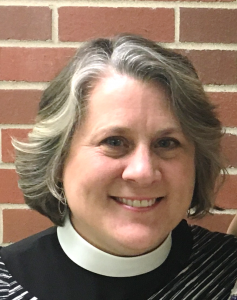 Michaelene Miller joined All Saints’ clergy as a Curate in July 2018. 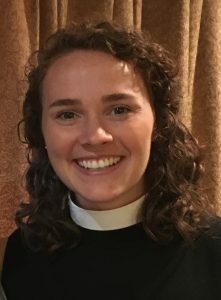 Michaelene was born and raised in Little Rock, received a BA in Psychology from Hendrix College in Conway, and most recently graduated from Virginia Theological Seminary in Alexandria, VA. Michaelene was ordained to the transitional diaconate in March 2018 and was ordained a priest in the Fall of 2018. She brings to All Saints’ her experiences of coordinating a series of social justice and civil conversations as the Program Manager at the seminary coffee shop, her work as a Youth Minister at St. Margaret’s in Little Rock, time with the Episcopal Service Corps in St. Louis, MO and ministry at Camp Mitchell in many roles including Staff Chaplain, Camp Director, and Counselor. When she is not in the office, one may find Michaelene cleating up for a game of Ultimate Frisbee, reading with a cup of tea, or hiking through the great outdoors. She is excited and grateful to answer this call to ministry at All Saints’ for the next two years as the Curate, where she will learn about parish ministry, participate in the pastoral care and worship of the church, and coordinate children, youth, and young adult ministries. 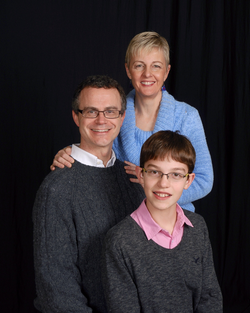 Kristin Smith is co-director of the music program along with her husband, Dr. Timothy Smith. As a member of the All Saints community for the past 16 years, she has served on the rector search committee and on the vestry, sung in the choir and taught Sunday School. She also chairs the organ committee. Trained primarily as a cellist, she currently performs with the Arkansas Symphony in Little Rock and maintains a private cello studio. She holds degrees in music from St. Olaf College and Indiana University. Her interests outside of music include running, cooking and reading. Dr. Timothy Smith is co-director of the music program along with his wife, Kristin Smith. He has been deeply involved with music over the past 16 years as choir director, organist and choir member. As an associate professor of music at Arkansas Tech University, Dr. Smith teaches piano, music theory and ear training. He has performed widely as both a solo and collaborative pianist and has adjudicated numerous competitions. He holds degrees in piano performance from St. Olaf College and Indiana University. When not playing the piano, Dr. Smith enjoys acting and accompanying in local theater productions. My name is Kimby Tackett. I am the Kids Connection director for All Saints as well as the Administrative Assistant. I have a passion for children’s ministry and have been a youth director and VBS director for eighteen years. As the mother of five amazing kids, I enjoy sharing the love of Christ with children and watching as their faith in God and their love for the church grows. In Kid Connection our mission is to meet children where they are in their walk with God as well as in their development. By using music, books, movies, and games, they love and are most familiar with, we will be able to connect to their lives and give them a spiritual foundation that will last a life time. She was born in Altus Arkansas in 1956, KaDee’s childhood was as backwoods as an oak tree but equally strong and well-rooted in the word of God. Of all her many blessings, the tallest is her family tree with her two sets of twins and ten grandchildren. A graduate of College of the Ozarks in 1978, she obtained two degrees in the physical sciences. And in 1990, she returned to formal education to obtain an MA in Christian counseling after which she volunteered as a part-time counselor for a small church in an adjacent town. She then pursued a doctorate in church administration but was forced to leave school in 1995, just short of obtaining the degree, due to family pressures and professional work priorities. An advocate for educating the youth of the church, she was a Sunday school teacher and director for a combined total of almost three decades. Her experience of exclusive fundamentalism drove her to seek a more inclusive God. This was discovered locally in the Episcopal church, where unconditional grace claimed her devotion and her love. With retirement in 2014 from almost 35 years of nuclear power, she has dedicated her service to God and to the cares and concerns of people who call home, All Saints’ Episcopal Church. Sherrie is a longtime member of All Saints’ and has served in many capacities at All Saints’, including that of Senior Warden. 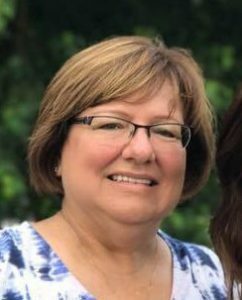 As Ministry Coordinator, Sherrie’s support for our ministries ranges from announcements in newsletters to updating our nursery to ensuring a warm welcome to those using our facilities to many, many more ways she helps keep ministry happening All Saints’. When not in the church office, Sherrie enjoys time with her husband, three adult children, and granddaughter. As a long time member (over 40 years) of All Saints’ Episcopal Church, most of my church members already know me. Thanks to the family of David and Mary Lu Garrett, my family joined a wonderful church. I am now starting something that I am loving to do and that is volunteering in the office some to help with anything I can and I am grateful for it. I always love my family and friends, and love being with my friends in church and outside my church. Other than that I like to travel, scrapbook, cook and of course baking all kinds of goodies. 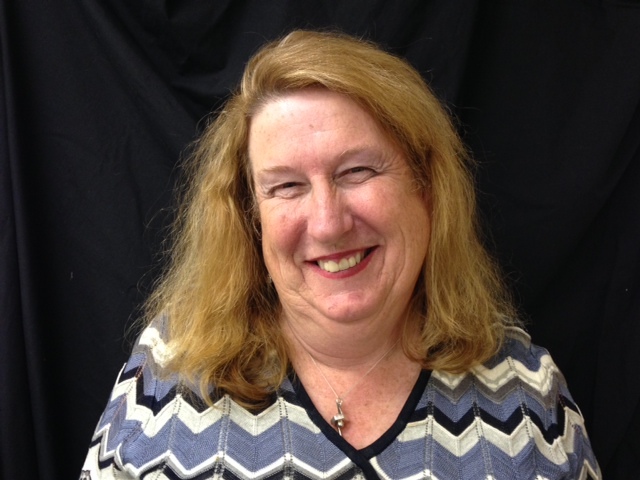 Laura is a native of Russellville, Arkansas, where her family has been for over 35 years. She graduated from Arkansas Tech University with her Bachelor’s in Early Childhood Education. 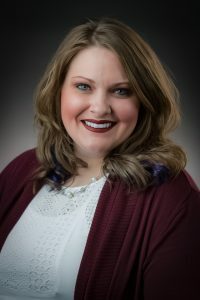 Professionally, Laura taught at Center Valley Elementary in Russellville for five years, and during that time she graduated with her Master’s in Teaching, Learning, and Leadership and earned her K-12 curriculum administrator license. After her fifth year in teaching, she took an administrator job in North Little Rock School District for a year. After her year in North Little Rock School District, she accepted the position of Director of Teacher Education at Arkansas Tech University. She has been with ATU for two years in this position. In December, Laura will graduate with her Educational Specialists Degree and will begin her doctoral program the following summer. Personally, Laura and her partner have two Australian Shepards that love to be outside and play ball. They all love to go on day trips and find any water to splash in! She enjoys painting and calligraphy, along with hand lettering projects. Laura has three older sisters and an older brother, along with 3 siblings-in-law, and 12 nieces and nephews. Traveling is at the top of her list, and taking any new adventure is always something she loves to do!